"The mantle of God" is one of those theological terms that I am only able to discern from its symbolic application in the Bible. Nowhere have I been able to find Scripture that says "this is what a mantle is, or means" in the Bible. In its very simplest application, it is understood to be a cloak, or outer garment; a covering. Strong's Concordance gives it no more significance than that. But when we read the Biblical accounts of Samuel, Joshua, Joseph, Elijah and Elisha, our spirits tell us there is a spiritual connotation to the mantles they wore. And that is what I wish to discover today. I think you will agree that the Biblical account of Elisha picking up the mantle that fell from Elijah is the most concrete example we have of the mantle's significance. First of all, we know that Elijah, the Tishbite, would prove to be a very important Prophet for the God of Israel. His name is derived from the Hebrew name Eliyahu, meaning "my God is YAHWEH", with the elements ('el) and (yah), both referring to the Hebrew God. Elijah was a Hebrew prophet and miracle worker, as told in the two Books of Kings in the Old Testament. His impact on the nation of Israel is great; he is given a specific anointing and ministry by God, and he is faithful to that calling -- even to challenging Baal, the Canaanite god responsible for rain, thunder, lightning, and dew. Elijah not only challenges Baal on behalf of God Himself, but he also challenges Jezebel, her priests, Ahab and the people of Israel. Elijah's service to God was so exceptional that he is just one of two men who were not subject to death before being taken to Heaven (Enoch is the other). And because Elijah's anointing was so important to the future of Israel, it was important that his work continue. And that is where we see the symbolism of that appointment being passed on to Elisha in the form of Elijah's mantle/cloak. Elisha was the attendant and disciple of Elijah. He was with Elijah as the Lord prepared to take him up to heaven in a whirlwind. They approached the River Jordan, where 50 Israelite prophets stood watching them from a distance. And Elijah took his mantle (cloak) and rolled it up and struck the waters, and they were divided this way and that, so that the two of them crossed over on dry ground. And when they had crossed over, Elijah said to Elisha, “Ask what I shall do for you before I am taken from you.” And Elisha said, “Please let a double portion of your spirit be upon me” ... As they continued along and talked, behold, a chariot of fire with horses of fire [appeared suddenly and] separated the two of them, and Elijah went up to heaven in a whirlwind. Elisha saw it and cried out, “My father, my father, the chariot of Israel and its horsemen!” And he no longer saw Elijah. Then he took hold of his own clothes and tore them into two pieces [in grief]. He picked up the mantle of Elijah that fell off him, and went back and stood by the bank of the Jordan. He took the mantle of Elijah that fell from him and struck the waters and said, “Where is the Lord, the God of Elijah?” And when he too had struck the waters, they divided this way and that, and Elisha crossed over (2 Kings 2:8-14). From this Scripture, we can understand that Elijah's mantle was a symbol of his ministry and an indication of his authority and responsibility as God’s chosen spokesman. We also see that this ministry and authority was passed on to Elisha through the taking up of the mantle. So, do you think that you, too, can receive a mantle upon your life for God? I believe at the center of receiving a mantle from God is a servant's heart. I also believe that we don't self-appoint mantles [or ministries] for ourselves, but rather receive our calling from the Holy Spirit. At the beginning of this post I listed several men of the Bible who clearly picked up the mantles God had for them. I just love the account given in 1 Samuel, Chapter 3, of the calling on Samuel's life. As we know, his mother Hannah prayed for a son, promising to dedicate him to the service of YHWH. The child served the Lord under the guidance of Eli, the priest. And the Bible is clear in noting that Samuel was faithful to answer every time God called him. Now Samuel grew; and the Lord was with him and He let none of his words fall to the ground [fail to be fulfilled]. And all Israel from Dan [in the north] to Beersheba [in the south] knew that Samuel was appointed as a prophet of the Lord. And the Lord continued to appear in Shiloh, for the Lord revealed Himself to Samuel in Shiloh by the word of the Lord. But it is the first sentence in Chapter 4 that shows the result of Samuel's faithful service: And the word of [the Lord through] Samuel came to all Israel. He carried the mantle of the Lord. The same could be said of Joshua and Joseph. Their mantles of authority and influence flowed out of their relationships; both with God and their mentors. Joshua learned at the feet of Moses, who had that special anointing from God. Joshua was able to recognize where his victories came from and how Moses' leadership was guided by his mantle of anointing. Although, as a child, Joseph received prophetic dreams of his future leadership, he grew into his mantle through relationships with his father, Jacob; Potiphar, the Egyptian captain of Pharaoh's guard; a prison warden; and even Pharaoh, himself. This example shows us that God will use those in authority over us to grow us and position us to wear the mantle He has assigned us. This idea of a mantle from God was brought home to me when I discovered the meaning of my maiden name. It is Ellison, which has been translated "son of Elias". According to a site which traces the origins of surnames, the origin of the name Elias is that it is a borrowing from the Greek; Elias being a cognate of the Hebrew Eliyahu, which is derived from 'ēlīyāhū (Jehovah is God). The name is a variant of Elijah, the same prophet of Israel [referenced above] who carried an anointing (a consecration) of the Spirit of God. That weighed heavy on my own spirit as I recognized that this important mantle had been laid down in my family in recent generations. I knew in the deepest part of my heart that God was preparing me to pick up my family's mantle. I could look back and see the people of spiritual authority God had put in my life, and the path He had laid out before me. I knew it would be a long journey for me; that I had much to learn, but I never doubted and have committed myself to the mission I've been given. Make no mistake, I do not say this to place myself above anyone else in the Body of Christ. I do not aspire to titles or offices. I only want to be as humble as Samuel and be as obedient as he was when he answered the Lord: "Here I am, for you called me. Speak, Lord, your servant is listening". So, are you ready to receive your mantle? Are you willing to invest in relationships with men and women who have true spiritual authority, and learn from them? 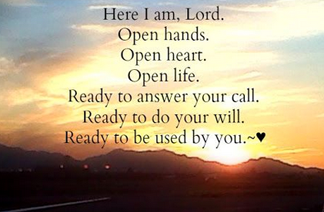 Are you ready to wrap yourself in the protective mantle of God's ultimate authority? Let the Holy Spirit empower you to do God's work. Let His mantle fall on you and prepare for supernatural ability to complete your unique assignment. Romans 11:29 For the gifts and the calling of God are irrevocable [for He does not withdraw what He has given, nor does He change His mind about those to whom He gives His grace or to whom He sends His call].